Tactical Video coordinated the deployment of nearly 50 video feeds for this year's event using Verizon's LTE cellular network. Rapid deployment of TacticalVIDEO products such as Rapidly Deployable Cameras (RDC’s) and MATRIX Highly Adaptable Surveillance Platforms enhanced the ability for S.W.A.T. teams to complete their missions properly. Video walls in the Urban Shield FUSION Command Center ran TacticalVIDEO’s advanced viewing software as the video display standard. Hardware and software integration from TacticalVIDEO results in cooperative situational awareness between FUSION, and participating S.W.A.T. and USAR teams. Quickly and easily putting cameras where wires can’t go is what TacticalVIDEO does best. TacticalVIDEO’s wireless surveillance equipment has changed the way law enforcement engages in surveillance. TacticalVIDEO gives responders a force multiplier, allowing for optimal action from S.W.A.T. and emergency response teams during critical situations. Urban Shield gives TacticalVIDEO a great opportunity to showcase the value of its products for law enforcement to complete their missions. COP LINK enables police to respond in seconds, rather than minutes. Police can instantly observe the scene with live cameras, pinpoint the threat, and initiate a response plan while officers are in route. TacticalVIDEO has pioneered this solution through years of research and development with school districts and elite law enforcement. More information: COP LINK, or please Contact Us. 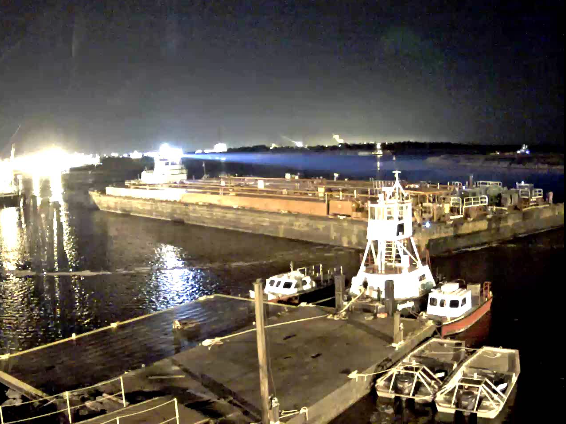 NAPERVILLE, IL - The United States Coast Guard recently began using 4G-LTE surveillance systems from TacticalVIDEO to monitor the Sabine-Naches waterway in Port Arthur, TX. The project developed after an oil tanker collided with a barge in 2010, causing 450,000 gallons of oil to spill out into the water. In a recent incident on 12/11/12 at 1:23 AM, a massive barge veered off course, colliding with a dock and several parked boats. 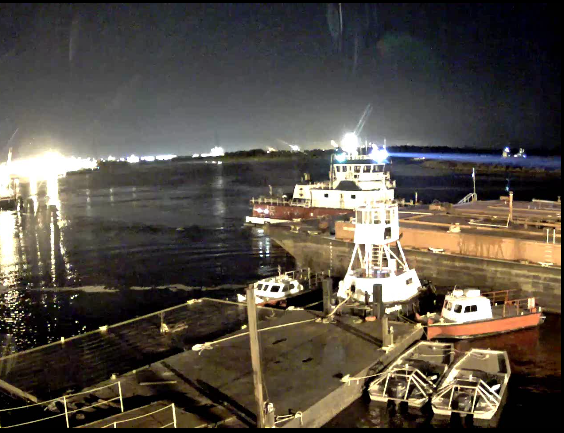 The barge continued to travel without documenting the collision. 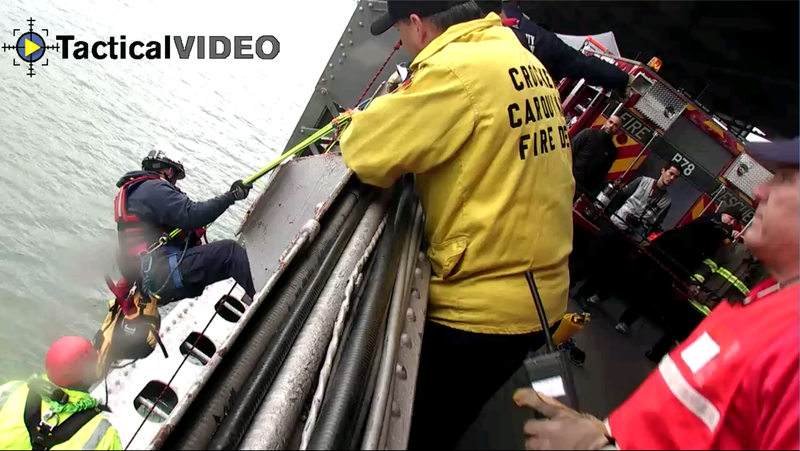 Much to the barge driver’s surprise, the Coast Guard and Jefferson County Sheriff had a live front row seat to the collision. Detailed high definition images from TacticalVIDEO enabled immediate response and prosecution. The images also facilitated official documentation of naval telemetry data from the collision. The U.S. Coast Guard approved release of this information. 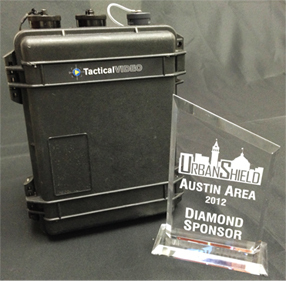 NAPERVILLE, IL – TacticalVIDEO earned a Diamond Level Sponsor Award, following successful deployments at two major Urban Shield events. In the most recent Urban Shield event in Austin, Texas, TacticalVIDEO partnered with Verizon Wireless to supply fourteen live, 4G-LTE wireless HD camera systems. The cameras provided real time situational awareness for Multiple-Assault Counter Terrorism Action Capabilities (MACTAC), and for Advanced Law Enforcement Rapid Response Training (ALERRT) scenarios. Camera deployment throughout various scenarios enabled real-time wireless viewing for response teams, and simultaneous streaming into Command & Control in the Emergency Operations Center (EOC) during the continuous 24-hour operation. TacticalVIDEO gives law enforcement and first responders a force multiplier to precisely and routinely conduct their operations. The Diamond Level Sponsor Award enables TacticalVIDEO to more easily engage with law enforcement agencies whose missions demand instant situational awareness. For more info about Urban Shield, contact TacticalVIDEO, or visit Urban Shield. NAPERVILLE, IL – Highly skilled S.W.A.T., Hazmat, and Search & Rescue teams gather in Austin, TX on December 1st at the 2012 Urban Shield Event, to demonstrate their elite operations in a number of tactical scenarios. During the event, TacticalVIDEO will provide live, wireless video surveillance to first responders in a number of controlled emergency scenarios. TacticalVIDEO will participate in the scenarios as the official video surveillance provider of Urban Shield. An elite video system has been specially designed for the event, thanks to a partnership between the following industry-leading companies: TacticalVIDEO, Verizon Wireless, Axis Communications, and Milestone Systems. Rapid deployment of TacticalVIDEO products such as Rapidly Deployable Cameras (RDC’s) and MATRIX Highly Adaptable Surveillance Platforms will optimize the ability for first responders to complete their missions. Video walls in the Urban Shield Command Center will also run TacticalVIDEO’s advanced viewing software as the video display standard. Hardware and software integration from TacticalVIDEO, combined with Verizon’s powerful 4G LTE Network will enable instant situational awareness between participating first responders and the command center. Quickly and easily putting cameras where wires can’t go is what TacticalVIDEO does best. TacticalVIDEO’s wireless surveillance equipment has changed the way law enforcement engages in surveillance. 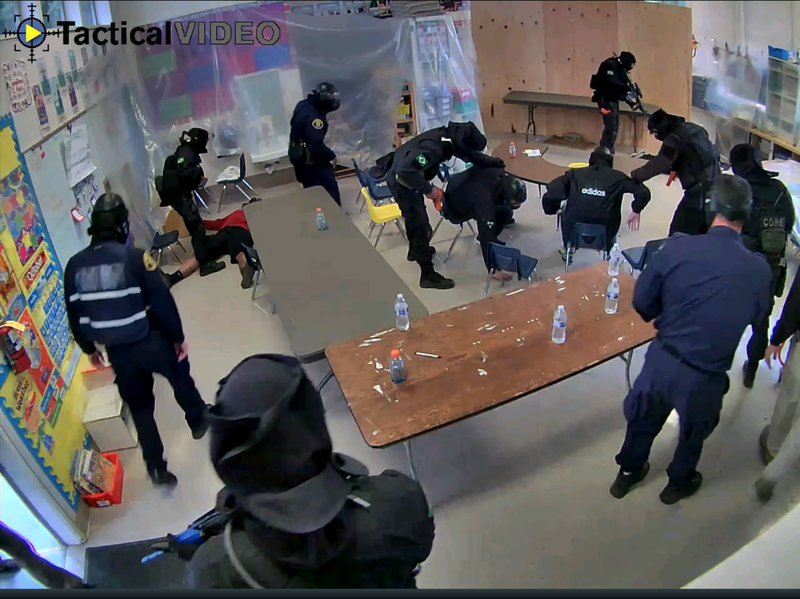 TacticalVIDEO gives responders a force multiplier, allowing for optimal action from S.W.A.T. and emergency response teams during critical situations. Urban Shield gives TacticalVIDEO and its partners a great opportunity to showcase the value of their products for law enforcement to complete their missions. NAPERVILLE, IL - Jeff Gibson, President of TacticalVIDEO, Inc., consulted at the Verizon Wireless Government & Education Symposiums, to discuss sales techniques of TacticalVIDEO solutions. The meetings were held in Charleston, SC, and San Diego, CA. TacticalVIDEO and Verizon Wireless engaged in training sessions to optimize sales efficiency of TacticalVIDEO products for Verizon M2M data plans. The core technology of wireless surveillance platforms from TacticalVIDEO is designed to integrate seamlessly with 4G LTE service from Verizon Wireless. Specifically, Jeff Gibson and Verizon Sales Reps trained on how to effectively acquire and engage potential clients. Key clientele for TacticalVIDEO solutions include Department of Justice Agencies, state and local law enforcement, education, and critical infrastructure. The 4G LTE network from Verizon Wireless has enabled the ability for TacticalVIDEO to optimize wireless surveillance to put cameras where wires can’t go. NAPERVILLE, IL –TacticalVIDEO and Verizon Wireless delivered dozens of live High Definition video feeds into Alameda County, Sheriff’s FUSION Command Center during the 2012 Urban Shield Event. Highly adaptable MATRIX wireless camera systems from TacticalVIDEO harnessed Verizon’s powerful 4G LTE Network for S.W.A.T. teams and key decision makers to have instant situational awareness during the non-stop 48 hour event. The MATRIX systems were deployed in several S.W.A.T. scenarios, and instantly streamed live video into Alameda Sheriff’s command center. Users equipped with mobile devices such as iPad’s also had live situational awareness on their mobile platforms. TacticalVIDEO’s highly adaptable MATRIX system optimized the deployment of several different types of cameras. Specific types of cameras included fixed cameras, Pan-Tilt-Zoom cameras, low-light cameras, and even a camera mounted on an un-manned UAV helicopter, which provided an incredible bird’s eye view of several scenarios! Overall, the event was a huge success. TacticalVIDEO and Verizon Wireless delivered unprecedented situational awareness to S.W.A.T. teams and decision makers. The event was a great example of how solutions from TacticalVIDEO become a force multiplier for law enforcement to better complete their missions. NAPERVILLE, IL– The most highly skilled S.W.A.T. teams in the world gather in Alameda County, CA on October 26th, 2012 at the annual Urban Shield Event, to demonstrate their elite operations in a number of tactical scenarios. In the upcoming 2012 competition, private vendors are invited to place their technology directly into live S.W.A.T. demonstrations. TacticalVIDEO will participate in the scenarios as the official video surveillance provider of Urban Shield. An elite video system has been specially designed for the event, thanks to a partnership between the following industry-leading companies: TacticalVIDEO, Verizon Wireless, Axis Communications, Milestone, and Dotworkz Systems. Rapid deployment of TacticalVIDEO products such as Rapidly Deployable Cameras (RDC’s) and MATRIX Highly Adaptable Surveillance Platforms will enhance the ability for S.W.A.T. teams to complete their missions properly. Video walls in the Urban Shield FUSION Command Center will also run TacticalVIDEO’s advanced viewing software as the video display standard. Hardware and software integration from TacticalVIDEO results in cooperative situational awareness between FUSION, and participating S.W.A.T. teams. Migration into the new facility marks a milestone of company progress, enabling TacticalVIDEO to centralize its administration, development and assembly of cutting-edge wireless video surveillance equipment. The new location also gives TacticalVIDEO the capacity to meet growing product demands, and accommodates for future expansion of business operations. For more information, visit www.TacticalVIDEO.com, or contact info@TacticalVideo.com. CHICAGO, Illinois – The fleet of rapid response vehicles deployed by Verizon Wireless for emergency amplification of cellular service now have an extra set of eyes from TacticalVIDEO. The vehicles, code named “Colts”, became permanently outfitted with wireless surveillance equipment to enhance perimeter security. With no existing surveillance systems installed to protect their assets, the Verizon fleet needed a permanent, durable solution that could withstand the constant travel demands of the Colt vehicles. A wireless surveillance platform from TacticalVIDEO, known as the “Matrix”, is now installed on each of the four vehicles in the Verizon fleet. A Matrix is a single investment that supports many mission objectives from a small, rugged unit, using plug and play cameras. A TacticalVIDEO Matrix is a stand-alone unit about the size of a lunch box, capable of secure wireless video communication over the cellular network. 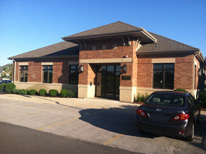 TacticalVIDEO completed the install prior to the 2012 N.A.T.O. Summit in Chicago, IL. Due to increased demands on the cellular network during the event, Colt vehicles appeared near the Summit to provide temporary support for the existing Verizon Wireless cellular infrastructure. The Matrix units from TacticalVIDEO are now the permanent watchdogs over Verizon’s fleet during all future deployments. PORT ARTHUR, Texas – Industrial cargo ships will navigate port safely and more efficiently, under the watch of the Jefferson County Sherriff and The United States Coast Guard. Extra sets of eyes in the form of cutting edge video surveillance equipment from TacticalVIDEO, are now permanently securing Port Arthur. The project developed through a long-term effort to improve security of the Sabine-Naches waterway. In 2010, an oil tanker collided with a barge, causing 450,000 gallons of oil to spill out into the water alongside Port Arthur. To prevent another disaster, seven camera systems from TacticalVIDEO will be installed at critical locations along the waterway. Each camera will have hemispherical range of motion, allowing the cameras to cover a wide field of view. Automated motion tracking sensors enable the cameras to survey an area autonomously, and alert the proper personnel when preconfigured activity occurs. Combined with the ability to zoom in and read lettering on ships from a mile away, the cameras will provide navigational assistance to increase safety near bridges and Coast Guard navigation towers. Additionally, TacticalVIDEO cameras are optimized by Verizon Wireless, allowing for completely wireless operation. Thus, cameras are not permanently tied down to one location, and are easily relocated on demand. Installation of the TacticalVIDEO camera system is scheduled for July-August 2012. NAPERVILLE, Illinois – The world wide web now has access to the official website of TacticalVIDEO. The website features several layers with company and product information, news, and customer support. The site design allows for Commercial and Law Enforcement viewers to explore the site independently. Due to the specialized and covert nature of TacticalVIDEO’s law enforcement products, only authorized users will have access to certain information on the site. Regardless, TacticalVIDEO’s core offerings such as RDC, Matrix and MasterKEY products are visible to the public.